Well this is quite a surprise, and a pleasant one too. Harley-Davidson just announced that it made an equity investment in California-based Alta Motors, makers of the Redshift. This surprise collaboration was put together so that the two bike companies can share notes and work on electric motorcycle technology and new product development. "Earlier this year, as part of our 10-year strategy, we reiterated our commitment to build the next generation of Harley-Davidson riders, in part, by aggressively investing in electric vehicle (EV) technology," said Harley-Davidson President and CEO Matt Levatich. "Alta has demonstrated innovation and expertise in EV and their objectives align closely with ours. We each have strengths and capabilities that will be mutually beneficial as we work together to develop cutting-edge electric motorcycles." The fact that giant Harley took enough notice of little old Alta to invest in them says more about Alta than it does about the Motor Company. While not always the shrewdest company, Harley knows a good thing when it sees it. And, as we've discussed before, Alta's Redshift is seriously good. The brass over at Alta seems pretty tickled by the whole thing, as you might expect. "Riders are just beginning to understand the combined benefits of EV today, and our technology continues to progress," said Alta Motors Chief Product Officer and Co-Founder, Marc Fenigstein. "We believe electric motorcycles are the future, and that American companies have an opportunity to lead that future. It's incredibly exciting that Harley-Davidson, synonymous with motorcycle leadership, shares that vision and we're thrilled to collaborate with them." To paraphrase Diamond Joe Biden, this is a pretty big f***in' deal you guys. With Project Livewire back on track, and Alta's history of electronic motorcycle innovation, this collaboration promises to change the face of the growing electric bike business. Levatich thinks so, too. "We believe that EV is where global mobility is headed and holds great appeal for existing riders as well as opportunity to bring new riders into the sport," said Levatich. "We intend to be the world leader in the electrification of motorcycles and, at the same time, remain true to our gas and oil roots by continuing to produce a broad portfolio of motorcycles that appeal to all types of riders around the world." So, what's that mean for us? 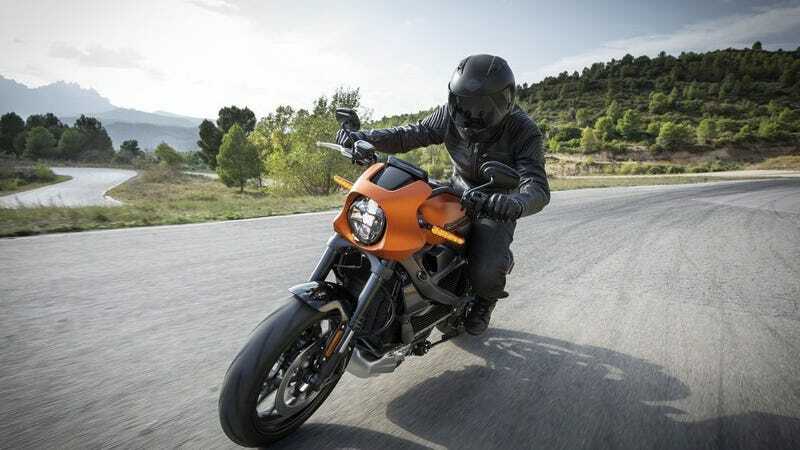 Hopefully it means a comprehensive, totally rad line of electric bikes from both companies and an energized (I see what you did there -JM) electric motorcycle market. Stay tuned for more about this in the future. Last edited by K2marer; 12-24-2018 at 11:36 AM. Could be fun; I'll try anything twice. Having driven EV cars I can only imagine how fun an electric motorcycle would be. Somebody will just release a speaker system that sounds like a loud exhaust. Lame. It'll be many years for e bikes to make any inroads. The problem is when you ride, like say I do, out in my twisties, rpm varies. I mean you aren't putting along at the speed limit riding slow in the corners. I can get about 110-120 miles a tank then I have to refuel. You're SOL on an electric bike. People that ride twisty roads, whether farm roads, canyons, mountains, name it, you aren't going to stop at 50 miles because you've been sport riding and the battery is gone. Then sit there for an hour or longer to recharge it just so you can get home. EV is great for DD, etc, but it doesn't work for sport riding. They are acceptable for a commuter but no way would I want to commute on a motorcycle of any kind in this smartphone while driving environment. True sport riding will remain gas powered for the foreseeable future. It would be interesting to see the range in heavy sport riding that has a lot of regeneration braking. I'm not sure I would want regen braking on a motorcycle. Would the braking be for both wheels? Would it be applied evenly? It's been a long time since I have bikes, but I don't remember using the brakes that often when doing spirited mountain rides. I'm also not sure I'd want the instant torque / power either but maybe that's just me and i'm wrong. For those that buy bikes and simply ride in the city, to and from work on the freeway or the douche bags that just rip around town without a helmet, I could see it selling well. I see the EV Harley making a solid in road with the Millenial crowd. Have classic looking and also retro bikes in EV form and I think they would sell well.